Roman Solaire is a fix-it man. By that mundane description, he fixes things for a living. He is not a plumber or electrician or carpenter and he is most definitely not in the phone book nor does he have a web page. When first we meet him, he is repairing a situation in a small neighborhood where a local goon, complete with several heavies to back him up, has been running a protection racket for some time. Now the man is in hock to his bosses and he has up the "insurance" payments on each store owner. That makes the situation quite broken so they hired Solaire to fix it. His connection with the recently created Court of International Law comes after he has been fixing things for some time. He does not ask for much from his clients which explains the quite meager living conditions he enjoys but then he does not really have a need for much so it suits him. This U.N.-sanctioned organization, with the mandate to "prosecute those that affect international stability", has had a rather shoddy track record of late. "We have tried, and failed, on numerous occasions to prosecute war criminals, dictators, government leaders, all those that affect peace and harmony in the world." So says the man who came to Solaire with an offer of contract work, Clive Travers. He says it to Solaire because he has decided that his own agents are too known to be effective against certain types. Someone new is needed, someone with a different approach to things Someone like a fixer. Like Solaire. For his part, Solaire was not exactly excited about the offer. He enjoyed doing what he was doing, especially since he worked really for himself. When he was gently blackmailed into helping, he reluctantly went along but despite his misgivings, even he was not unhappy with the kind of money that the CIL had to toss around. First class travel. Swanky hotels. Need a car - buy a car. A man could get used to this. Of course, working largely alone a man could, going up against the kind of powerful criminals the CIL sic him on, a man would get dead pretty fast and the percs in the world do not stop fists, knives, or bullets. 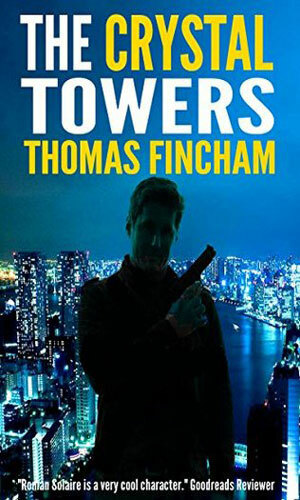 Book 1 of the Solaire Trilogy: Roman Solaire is in New York where he looks for a connection between an upscale new development, the firm handling the construction, and ties to international terrorism. 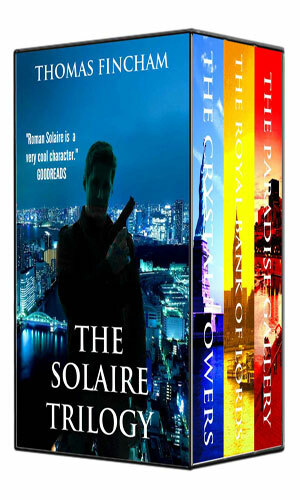 Book 2 of the Solaire Trilogy: Heading to London, it is the task of Roman Solaire to find proof of the actions of the board members of a very prestigious bank, made harder because a highly skilled assassin is gunning for Solaire. Book 3 of the Solaire Trilogy: This trip takes Roman Solaire to back across the pond to Montreal where he hunts a innovative computer engineer while romancing the lovely owner of a high-class art gallery. The writing of the Roman Solaire tales is nothing to get excited about but the concept is pretty entertaining and the author does his job well enough to get that across. The action is a bit staccato-ish and for someone who has been doing the fix-it work Solaire does for as long as he apparently has done it, he sure gets banged up a lot. But at least he has his chances to bang back so that is something. The adventures are very, very fast reads and Solaire definitely grows on you. While my opening statements may not sound that inspiring, I would buy the 4th book should the writer create it. That says something.